What does the Safarov case tell us about Hungary today? On February 19, 2004 Ramil Safarov, a lieutenant of the Azerbaijani army, used an axe to kill Gurgen Margarjan, a lieutenant of the Armenian army. The incident took place in Budapest where both men were participating in a NATO English-language course. As it turned out Safarov was a refugee from the region of Nagorno-Karabakh, which was the scene of a bloody conflict fought between Armenia and Azerbaijan between 1988 and 1994. During his trial Safarov claimed that he committed the horrendous act because Margarjan had insulted the Azerbaijani flag (a claim non-corroborated by evidence or witnesses) and because “until they [Armenians] live we [Azeris] will suffer”  . On April 13, 2006, the Hungarian court sentenced Safarov to life imprisonment without possibility of a pardon until 2036. The judge cited the premeditated nature and brutality of the crime and the fact that Safarov showed no remorse for his deeds as the reasons for the sentence. On February 22, 2007, the court upheld the ruling following an appeal filed by Safarov's lawyer. While Safarov was busy translating Hungarian literature into Azeri in his prison cell, his story was picked up by Azeri media and extremist organizations such as the Karabakh Liberation Organisation, which initiated a campaign aimed at obtaining his extradition. Azeri officials were not immune to the campaign, as demonstrated by human rights ombudsman Elmira Suleimanova’s praising of Safarov as a “model of patriotism for Azerbaijani youth” . Although Azerbaijan’s president, Ilham Aliev, initially showed restraint, we know from Hungarian sources that Azerbaijan actively sought to persuade Hungary’s government to extradite the murderer. Safarov’s surprise extradition on August 31, 2012 and his immediate pardoning upon arrival to Baku, which sent a shockwave across the international community and severely affected Azeri-Armenian relations, has raised a few intriguing questions not only outside Hungary but inside the country. The first was raised by The Economist , which calls Hungary’s move surprising in light of Hungarian diplomats’ reputation of being “usually smart, supple and well-informed“ . Hungarian journalists were at first also puzzled by the move, but it soon became clear that the Foreign Ministry, which was fundamentally aware of the complexity of Azeri-Armenian relations, had been sidelined within the government. Most commentators have since formulated the opinion that the decision to extradite Safarov was taken by the Prime Minister himself and that the civil servants working under Orbán in the newly created state secretariat for foreign affairs and external economic relations had severely miscalculated the potential consequences of Safarov’s extradition. From this perspective the incident appears as one of the symptoms – albeit painfully consequential – of the malfunctioning of an over centralized decision-making structure under the Orbán government. But the case also hints at a more disturbing facet of Orbán’s “system of national co-operation”. Although Péter Szijjártó, the state secretary for foreign affairs and external economic relations “informed the public in several television and radio interviews that every aspect of the transfer was in accordance with the 1983 Strasbourg Convention and was a transparent procedure” and “denied every allegation indicating that the case was influenced by energy relations between Hungary and Azerbaijan”, it is in fact very hard to interpret Safarov’s release as anything else but an attempt to strike a political deal with a resource-rich country sitting on a big stack of monetary reserves. The letter, signed by the Azeri deputy minister of justice on August 15, containing what the Hungarian government portrayed as guarantees that Safarov would not be given amnesty actually reveals that the Azeris never promised to keep the man behind bars. Experts on international law and foreign affairs who were interviewed by the media agreed that if the Hungarian Ministry of Justice really wanted guarantees, it should have asked its Azeri counterparts to clarify their commitment to the Convention on the Transfer of Sentenced Persons . But there was no official response to the Azeri letter. If the Hungarian side remained silent, it is most probably because Hungary's Minister of Justice (and the Prime Minister himself) knew very well that the Azeris would release Safarov after his arrival to Azerbaijan. It would not be the first time that Orbán, who rarely misses an occasion to highlight his government’s commitment to forging new “Eastern partnerships”, uses “unorthodox measures” to seduce an autocratic government into opening its market to Hungarian companies, investing in Hungary or buying governmental bonds. It is worth recalling that during the Chinese premier’s visit to Budapest last June, the Hungarian immigration authority had called all Tibetan refugees who were living in Hungary legally into its office for “data checking” and that the police had prevented activists holding Tibetan flags or banners of the Falung Gong movement from demonstrating . What this as well as Safarov’s extradition shows is that Hungary’s current government is prepared to go a long way – if necessary, against fundamental human rights – in order to secure its economic interests. As commentators have pointed out, however, the brutish approach taken by Orbán may not even achieve this objective, as Hungary (a small country, which has been incapable of steering a straight course in the last two decades) has little to offer to China, Azerbaijan or other countries lauded by the Prime Minister. As it turns out on September 3 the state oil fund of Azerbaijan issued a statement in which it declared that “SOFAZ is not considering any investment into debt obligations or other financial tools in Hungary”. So, to use a familiar Hungarian expression, the government may actually find itself falling in between two horses. The prime minister’s inability to make anything substantial out of his cherished “Eastern partnerships” so far may, as one well-informed blogger pointed out, actually force his government (desperate to find external sources of funding to repay its maturing debts) to change course and return to the negotiating table with “the old, decrepit, tired Europe that is incapable of handling its own problems but ponies up a lot of money for Hungary” . On September 3 – the same day Azerbaijan’s state oil fund issued the mentioned statement – Viktor Orbán surprisingly talked about the resumption of negotiations with the EU/IMF team. Rebuking his earlier statements, he said that “the ball is now in Hungary’s court” and expressed his firm belief that a favourable conclusion to the negotiations is around the corner. This may, of course, just be another step of the “peacock dance” , but time is running out. Without further assistance from the EU Hungary will ultimately collapse – and the markets know it. Finally, concerning domestic politics the main question is whether the opposition will be able to capitalize on such severe blunders to explain to the public what it sees as deeply wrong with Orbán’s new regime and what it would do differently. Although left-wing opposition parties all found something to say on the Safarov case, none of them managed to formulate a strong message that would stay with the public. The demonstration organized on September 4 by the One Million for the Freedom of the Hungarian Press Movement was also more of a failure than a success in that it appeared in the guise of a pro-Armenian rally (thanks to the numerous placards asking Armenians to pardon Hungarians), instead of focusing protest energies on the obvious dilettantism of those in power. The relatively low number of demonstrators (app. 2000 people) also shows that Hungarians have become rather immune to scandal. In other words, while Orbán will not escape unscathed from the incident, it will take a lot more than an international controversy to pull the rug from under him. Kristóf Szombati is a sociologist and co-founder of the Hungarian green party (LMP). He currently works for the Prague office of the Heinrich-Böll-Foundation. This is because the Azeri letter only addressed article 9 of the Convention – stipulating that the "competent authorities of the administering State shall... continue the enforcement of the sentence immediately or through a court or administrative order" – but made no reference to article 12, which states that "Each party may grant pardon, amnesty or commutation of the sentence in accordance with its Constitution or other laws". 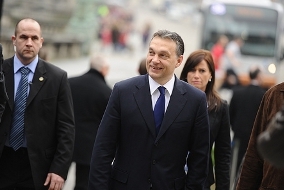 The Heinrich Böll Foundation has compiled a dossier containing articles and interviews on the situation in Hungary since the right wing government came to power in April 2010. The driving goal behind the project is to analyze and interpret the changes in the domain of public life at ‘half-time’, two years before the next parliamentary elections.